Our office regularly cares for the dental needs of children as young as three years old. However, if you notice that your child has a problem with their teeth or gums earlier, please don’t hesitate to schedule an appointment. You may also want to bring your little one to your own dental checkup around age two to introduce them to the sights, sounds, and friendly team in our Chaska dental office! We can’t wait to put your child on the path to a lifetime of healthy, beautiful smiles. Your child's independent checkup at age three will involve a tooth-by-tooth inspection and a periodontal (gum) exam. The dentist will check for proper development as well as tooth decay and other areas of concern. This is also your opportunity to ask any questions you may have regarding your child’s dental health. How often should I clean my child’s teeth? What toothpaste should they use? And what about floss? Could my child benefit from extra fluoride exposure? 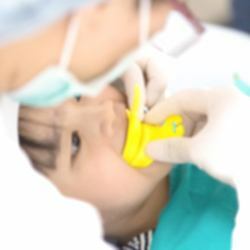 Are there any extra steps I can take to prevent cavities and infection in my child’s smile? Make a list of any questions you have for your dentist so you don’t leave with any remaining doubts. Prevention starts early. In fact, you should clean your baby’s gums before any teeth even erupt. Run a warm, wet washcloth over your child’s gums after each feeding to clean away any sugars leftover from formula or milk. When the teeth erupt, begin brushing with a rice-sized bit of non-fluoride toothpaste. Begin using a pea-sized amount by age three. As soon as teeth touch each other, add dental floss to the routine. Do not add a mouth rinse until you are sure your child can spit it out. As your child grows, they will need regular checkups and hygiene visits to ensure optimal oral health. Our team will also teach them oral homecare techniques in order to instill better brushing and flossing habits. Your little one should develop the dexterity to brush and floss by themselves by age six or seven, but that doesn’t mean some spots won’t be missed. Make sure you are monitoring your child’s dental hygiene habits until you are sure they are doing an excellent job cleaning every single tooth. Children’s teeth are the most vulnerable to cavities between the ages of six and 14. During this period, fluoride treatments can provide extra protection for the tooth enamel against decay. 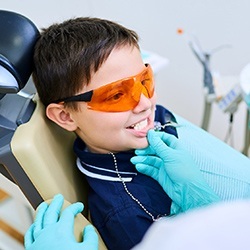 Fluoride treatments performed at the end of each checkup and cleaning offer an extra dose of protection to strengthen enamel throughout childhood. Fluoride treatments are also beneficial for adults, as well. In addition to helping your child brush twice a day and floss daily, you should also develop healthy eating habits for better oral health. Limit their soda intake, and help them understand the impact that sugar and sweet treats have on the teeth and gums. Limit candy consumption to the kitchen to reduce mindless snacking and to keep your little one from falling asleep with candy in their mouth, which is a significant cause of tooth decay in young ones.